Hi, my name’s Aimie and I’m a business analyst in DWP Digital. 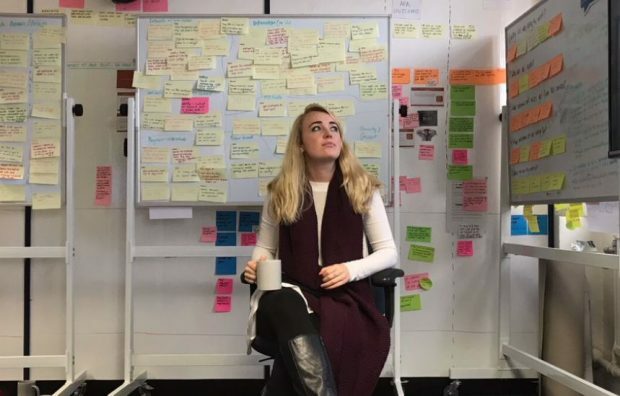 I’m part of the same team as user researcher, Julie Maybury, who recently blogged about her top user research role models. As another specialist on the team, this made me think about my role and writing this blog post about what made me consider a career as a business analyst. I started my career as a recruitment consultant and spent most of my days bored, reading through CV after CV. What it taught me was most people were doing more exciting things than me! During my stint in recruitment, I spent a lot of time reading through articles and attending networking events. It was then that I learnt that there was a struggle for gender parity in technology jobs. Across the industry, organisations are battling to get more women to consider technology careers, particularly in leadership roles. Being part of the ‘Women in Technology’ movement really appealed to me and I feel it has opened up a path of opportunities I didn’t realise were available. I have always been very motivated so knowing that I will be supported in my career choices helps drive my ambitions. As a business analyst, I have the chance to make a difference. Through my unique understanding of process and services and a strong grasp of user needs, I can find the best-fit solutions that make a difference to the users I work with. There’s no better feeling than getting positive feedback in response to something you’ve been part of delivering. I have always been a people person so managing stakeholders and communicating with my team is something I really love! In my role I have to meet with lots of different people from many different backgrounds. This helps me to fully understand what everyone in my team is doing, as well as other people around the business. And it helps to give me the credibility I need when driving change throughout the organisation. I like to consider myself quite nerdy when it comes to finding out about things I’m particularly interested in. As a business analyst, there is always more to learn and qualifications I can complete. I’ve found technology to be a fast-paced industry where I always need to be ahead of the game, and I enjoy keeping up with the latest trends and ideas. There is more than enough to keep my brain active and I’m never bored, which is nicely different to the earlier days of my career. 5. I like solutions, not problems! Day in and day out, I have problems brought to me, and it’s my job to find the solutions. This totally suits me as I’ve always considered myself a bit of a problem solver. Sometimes a problem can take minutes to think about and solve. Other times it can take months. But irrespective of how long the problem takes to solve, I love the challenge and I’ve always got something to keep me busy. I could go on and on about how much I enjoy my job and the reasons why. However, I’ll leave you with one last thought, and that is: I’ve never had one day the same as another. Whether I’m running workshops, drawing up process maps, or releasing a service, I am always doing something different and I always enjoying it. DWP Digital is currently recruiting technology specialists. To find out more visit our DWP Digital Careers website and have a look at our LinkedIn page. You can also subscribe to this blog and following us on Twitter @DWPDigital.